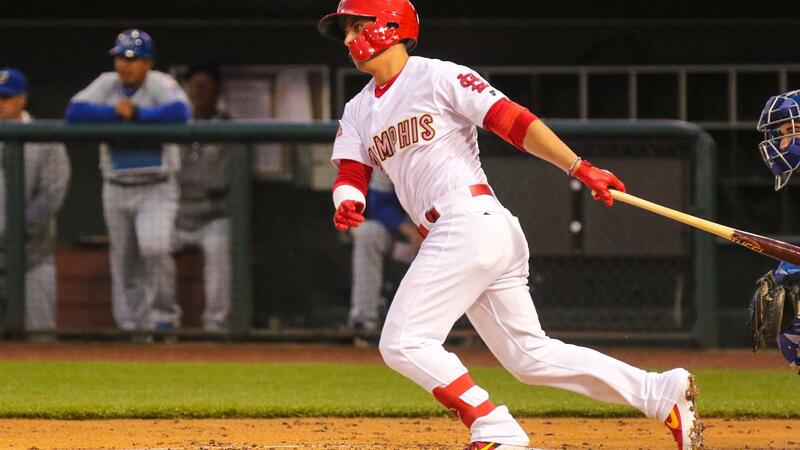 ROUND ROCK, Texas - The Memphis Redbirds (4-6) exploded for eight runs in the fifth inning en route to a 9-4 win over the Round Rock Express (Astros) Saturday night in Round Rock, Texas. Tommy Edman went 3-for-5 with a double and three runs scored, and Lane Thomas was 3-for-4 with two RBI. Edman now has five multi-hit games in eight contests this season, including back-to-back three-hit outings. John Nogowski, Adolis Garcia, and Joe Hudson all had two-hits apiece for the Redbirds. In the fifth inning, Memphis sent 12 men to the plate and scored eight runs on eight hits. The big blows in the inning came on a Ramon Urias three-run double and a two-run single by Thomas. Harold Arauz, recently transferred from Double-A Springfield, got the win with 6.0 innings of work on the hill. He allowed four runs on eight hits, walking four and striking out four. Chasen Shreve, Jesus Cruz, and John Fasola combined to finish the game with 3.0 scoreless innings of relief. The Redbirds were 7-for-13 with runners in scoring position in the game. Memphis and Round Rock finish their four-game set with a 1:05 p.m. game tomorrow and an 11:35 a.m. game on Monday. The Redbirds' next home game is on Tuesday at 6:35 p.m.